We have new eight year old around here as of yesterday! He has a huge interest in dinosaurs (that was last year's birthday) and now he's added a penchant for geology into his hobbies. There is something about unearthing treasures that speaks to this boy! He loves fossils and stones and gems and almost every day he can get outside finds him running back in at some point with mud splattered pants and a treasure to show me...a new flower blooming, a cool rock from the field, a robin's egg shell. I love his enthusiasm and joy over nature! Eight is a fun age (even when this choleric makes it just a bit more than challenging sometimes!). 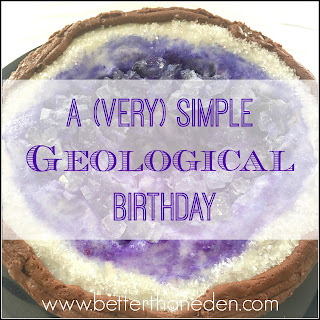 He chose a geology theme for his birthday which was super simple and fun. I made it a surprise and took the four older boys but didn't tell them where we were going. We had never heard of this particular show or anything but it looked cool and apparently it was a good pick since he declared afterward, "it was just what I wanted!" They actually put on a great show. The dinosaur puppets are incredibly lifelike and loud and even genuinely scary at some points! He was hoping to get picked to be one of the kid volunteers but it wasn't meant to be. We celebrated on his actual birthday with Godparents and grandparents. And rocks. He decided this was the best "geologist's outfit" he could come up with. I am ALL ABOUT using things that we already have in the house. Or in this case, also outside the house. While we ended up with just simple pizza for dinner, I had Trader Joe's jelly bean "jewels" to dig out of graham cracker sand (*cough* leftover from Easter) and some rock-resembling chocolate covered almonds both out on the table for treats! If the weather had been nice we would have done an outside gem hunt or done some searching for treasure in a kiddie pool of gravel which was my original idea. But our spring has been sooo rainy and cold and lousy we couldn't count on being able to go outside. We tried to come up with fun indoor games and the night before had me searching online for free geology bingo. Which happened to lead me to...Jessica's blog, of course! That lady is the QUEEN of birthday themes! While it wasn't exactly geology themed, it was the closest I could find and the boys have been loving identifying flowers and plants lately anyway. We actually did try to be all creative and attempted to make our own with an online recipe and natural dyes but even after a full week it was barely growing. (At least the jars look pretty?) So off to the candy store we went. Other gifts from our guests included this great fossil book, this rocks and minerals book, a legit shovel and pickaxe, a dinosaur dig kit, a geode cracking set, and this geology collector's set. He was beyond thrilled! 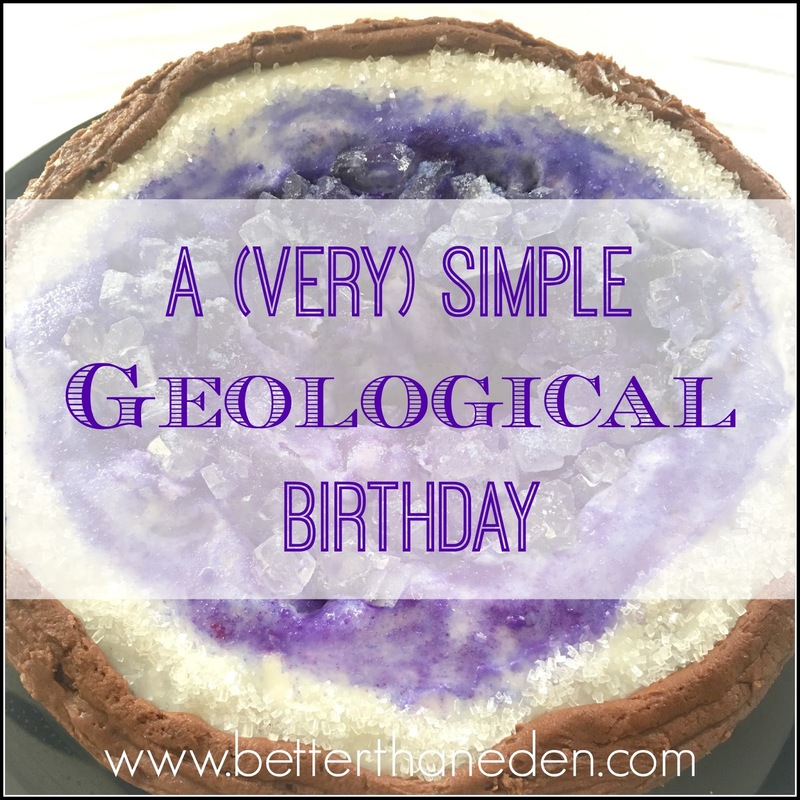 After gifts were opened and cake eaten the kids all helped crack open a few of the geodes outside on the driveway which was pretty cool and was another fun geologically-themed activity. He doesn't know it yet but we also have plans to visit a local fossil excavation park once the weather improves a bit. He'll love it. Junior junior geologist in the same geologist get up. And I found a venus fly trap randomly at Aldi's that we're all geeking out about! His cake request was first an amethyst (his favorite gem) but then we decided to go even cooler (mostly because I had no great ideas on how to do an amethyst cake) and opt for a geode. I used a large tempered glass bowl to bake the cake a few days before the party. It was the best way I could figure out to get a rounded bottom and top I could turn into the open geode. I had no luck finding natural purple sanding sugar at any of our local stores...they used to carry this line but no longer. But then I had the epiphany that you can make your own colored sugar by get this...coloring sugar. ;) So in a plastic sealable bag I shook some cheap white sugar (maybe 1 1/2 cups?) with both beet powder and spirulina powder (both from McCormick's new pack...maybe 1-2 tsp. of each) until the color looked purple. It was very light but I had a feeling that as soon as it got some moisture from touching the frosting it would darken to a better purple and I was right! While I'm decorating I'm usually just working as fast as I can to finish before a toddler wakes up and not so much worrying about taking pictures! But I did take the above one while I was decorating. I took a few messy scoops out of the top of the cake to create the hollow. I coated those with a priming layer of frosting, let that sit, and then added more of the white frosting gently as to not pull up the chocolate crumbs. The best part about this is that it's supposed to look uneven and random so it was super quick. I kiiinda wish I had shape the entire cake and hollow a bit more oblong but it was fine. On top of that white frosting I sprinkled a bunch of my colored sugar and it slowly got deeper and deeper colored with variation that made it look even more natural. Around the outer rim I put a circle of white. I then smoothed that and added a little bit more of the purple and kinda rubbed that in with the back of my spatula which gave it a smoother look to the rim. On the pure white I carefully placed some clear decorating sugar crystals to make it glitter. I decided super last minute to add some of the clear rock candy chunks that I had bought at the candy store. I smooshed them randomly into the edge of the crater, then sprinkled those with the purple sugar and a tiny bit of water to help it stick and also turn it darker. It worked really well!! The outside I coated super quickly with chocolate frosting. Again, made super easy because rocks are supposed to be uneven and bumpy :) I used a piping bag to just get the clean edge around the top. And that was that! I was pretty happy with how it turned out and more importantly, the birthday boy was thrilled! He decided to use his gemstone collection to outline the cake :) Maybe someday I'll have a bit of self respect and iron my tablecloths before taking pictures...but probably not. He had a great day, I think, and I'm so happy about that. I love seeing each of my kids' interests and uniqueness and their birthdays are my chance to celebrate that with them. In just a few weeks this same boy will be receiving our Lord in the Holy Eucharist for the very first time! If you've made it this far and have a moment, could you please say a prayer for him? I would be so so grateful! I will definitely pray for him, first communion is such a blessed time. I am so glad he had a party that reflected him and I just adore that cake! This is a lovely party. It looks like so much fun. The cake is amazing. Count me super impressed. I don't know if you've seen The Shawshank Redemption (or read the book), but the picture of him with the rock hammer just slays me. As a grownup geologist, I'd say his outfit is pretty spot on! Add a bright reflective safety vest, a ball cap and some boots, he's nailed it!